Harrogate’s MP and council leader went “on the buses” with staff, customers and volunteers from a local charity to mark Disabled Access Day. Disability Action Yorkshire teamed up Transdev, who provided a static bus in the town centre, which enabled disabled people to practice accessing public transport without any pressures. Disabled Access Day is designed to celebrate good access and create opportunities for disabled people to try something new. While getting on and off a bus may seem a fairly ordinary and mundane task to non-disabled people, for those with a disability it can present a very significant challenge. Both Andrew Jones and Richard Cooper – who have signed up to the charity’s Think Access campaign – spoke to representatives from the charity and Transdev about the fleet of new electric buses, which have added features to benefit disabled people. 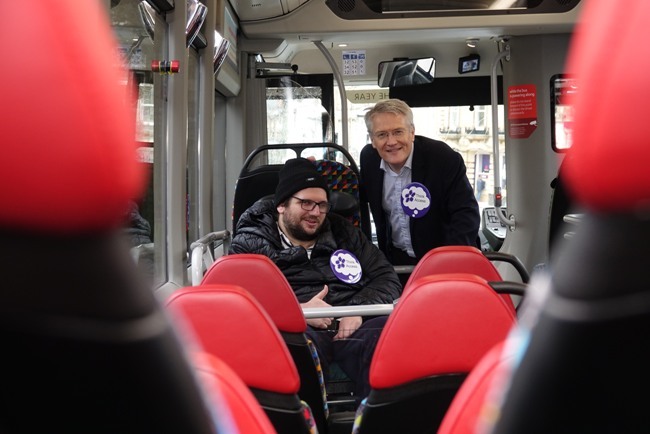 And to test out the new bus – which features a hydraulic lowering system, a dedicated disabled passenger alert and each stop announced in advance – was Disability Action Yorkshire customer and wheelchair user, Darren Asquith. Jackie Snape, chief executive of Disability Action Yorkshire, said: “Thanks to our friends at Transdev, we used Disabled Access Day as a golden opportunity for us to broaden our Think Access campaign as well as reviewing the new bus. “More disabled people would like to use public transport, but are faced with issues like: How will I get on? Will there be room for me? How will I get off? Will I hold everyone up? “Darren took the opportunity to try out the bus for himself, including negotiating his wheelchair in and out of the dedicated wheelchair space. He made some very valid observations.